Personal: Pronounced HOW-gen…Likes to play golf, spend time with friends and family and watch movies…Enjoys going to dance clubs. 2017: Defeated Brian LeClair 173-158 in title match to win Suncoast PBA Senior U.S. Open for first PBA50 Tour title...Named PBA50 Rookie of the Year. 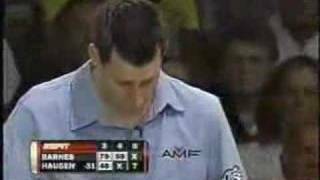 Career: In 2016 won Gene Carter's Pro Shop Classic by defeating Bill O'Neill 289-255 in title match for fifth career title...In 2014 won Scorpion Championship for fourth career title defeating Martin Larsen in championship match 213-206...Finished third in USBC Masters losing to eventual winner Jason Belmonte in semifinal match 235-234...Waited 200 career events for his first title (Lake County Indiana Classic) and just nine for his second (H&R Block Tournament of Champions)…Had finished second twice prior to his first victory, in the 2001 Greater Louisville Open and the 60th U.S. Open in 2003…Has two top five finishes in 2009-10 and 2010-11 seasons...Had four top 10 finishes in 2011-12...Won 2012-13 Mark Roth Classic by defeating Scott Norton in championship match 215-194 for third career Tour...Was first win since winning 2008 Tournament of Champions...Owns 23 PBA regional titles and two PBA50 regional titles...PBA West Region Player of the Year in 1997. 2008 H&R Block Tournament of Champions, Las Vegas, Nev.
2017 - Suncoast PBA Senior U.S. Open.